of all popular ink formulas in amounts of a 1/4 lb. or more. Displays Piece Count and Weight - pounds, ounces, or grams. Two different weight capacities to match your particular counting need. Perfect for labels, envelopes, business cards, etc. 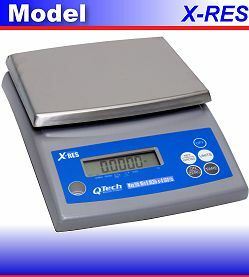 The QTech QCS Model is our most popular and versatile counting scale. Available in weight capacities from 3 to 65 pounds, it is perfect for counting both small, lightweight items and large, heavy parts. The accumulation memory feature maintains a running subtotal up to 1 million pieces. The QCS is powered by AC current, or it’s own, long-lasting rechargeable battery - perfect for easy portability. The internal resolution is 1 part in 600,000 - the 3-pound model, 1 part in an incredible 2,000,000! This means you will get dependable and highly accurate counts. 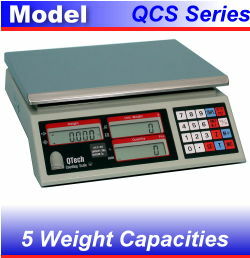 The QCS may also be used for weighing, check-weighing, batching, kitting, as well as postal weight verifications. Also a perfect solution for coin, ticket, token, pull-tab, and coupon counting. Printers will especially appreciate the time savings an efficiencies of the QCS counting scale. It will provide quick counts of business card, labels, envelopes, etc., ending customer disputes forever! 3, 6,15, 30, or 65 LB.